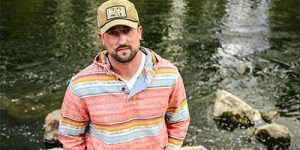 Austin Eubanks turns tragedy and trauma into triumph by learning that pain can be managed and healed without misusing drugs. Most Americans know where they were on Sept. 11, 2001, but for Austin Eubanks, April 20, 1999, is the date that changed his world. He knows exactly where he was: crouching under a library table next to his best friend at Columbine High School in Littleton, Colorado. Eubanks survived the Columbine shooting but not without feeling physical pain from his gunshot wound. His emotional pain, however, was far greater. He says although his physical pain measured a three or four, his emotional pain topped the scale at 10. None of the first responders or doctors that day ever asked him about his emotional pain or intentionally helped him manage it. Instead, they medicated Eubanks only for his physical pain. He was 17 years old and had never drank alcohol, smoked marijuana or used illicit drugs. But the drugs the doctors — the professionals, the people with degrees and knowledge — prescribed made him feel better. Even after his physical wounds had healed, he continued to take the drugs because he was still hurting. Neither he nor his medical caregivers had distinguished between the two kinds of injuries — physical and emotional. He told them he was in pain, so they gave him drugs to mitigate it. In talking about his resulting opioid addiction, Eubanks admits he did not know he was misusing drugs until half a decade later. He just knew that the drugs made him feel better and that smart people had prescribed them to him, so he thought he was OK. He remembers experiencing his first bout of withdrawal at 23 years old when he had gone out of town and forgotten his pain pills at home. Despite his addiction, he outwardly appeared healthy, functioning and successful. Driven and hyper-creative, Eubanks excelled at advertising and design. Layer in doses of Xanax, oxy and Adderall, and he looked calm and productive. “Adderall allowed me to work 70 hours a week,” he says. “I had a Murphy bed in my office. “Sometimes what our society defines as success — a suit, 70 hours a week — isn’t success at all. My inner circle knew that I wasn’t well, but a lot of people were willing to turn a blind eye as long as work was getting done,” he says. Two years later, he got separated from his wife and found himself wanting help again. He called his parents and told them he didn’t want to live the way he had been living. A few hours later, he was on a plane to Texas on his way to a 90-day treatment program. This second attempt at sobriety stuck a little better than the first. He emerged feeling good and was able to reconcile his marriage. He felt confident in his sobriety from drugs. Nevertheless, he still felt the lingering emotional pain. “It was like I had pressed a pause button on my emotional growth,” he says. Over time, instead of pills, he medicated with alcohol and eventually pot. He deceived himself into thinking he had beaten his opioid addiction, but the alcohol lowered his inhibitions, and he eventually started abusing oxy again. In 2011, he woke up in a Denver jail with no recollection of what had happened or how he had ended up there. By his own admission, he was using a tremendous amount of oxy, and even as he navigated the judicial system, he was able to continue using in spite of probation-required drug tests. If he failed a urinalysis for opiates, he had a legitimate prescription for them — and a way around court-ordered restrictions. Again, he found himself estranged from his wife and two sons. Upon reflection, he determined that he had never been truly willing or humble enough to accept treatment. He remembers thinking, “I was going to get better, or I was going to kill someone because of my reckless behavior.” April 2, 2011, about two weeks shy of the 12th anniversary of the Columbine shooting, is Eubanks’ sobriety date. He admitted himself to a long-term residential treatment center in Commerce City, Colorado, called Stout Street Foundation (SSF). Now on its board of directors, Eubanks credits SSF with saving his life. Here, he found humility: “They shave your head. I remember the willingness I had to admit that I had none of the answers.” He also found treatment that finally addressed his underlying emotional issues. “I was able to resolve trauma, to go through the stages of grief,” he says. 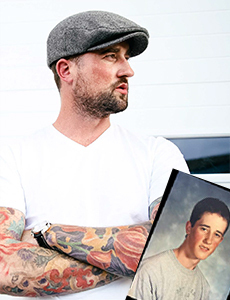 His willingness to walk away from his career and everything in his life for a year was a sign to him that he was ready to truly embrace recovery. “I had to give up to show that I had the willingness not to give up,” he says. Re-entering life slowly was important to Eubanks’ recovery. He says he would work for months and months and then get one privilege back. He ultimately changed career fields because going back into advertising felt riddled with mines to his recovery. It would be far too easy to slip into old patterns and behaviors. He wanted something different. “I had to learn the difference between feeling better and being better,” he emphasizes. Part of being better was dealing with the trauma from the shooting. He had lost some hobbies, such as fly-fishing, which he had enjoyed with his best friend, Corey, who had died next to him. In pain and in addiction, it was too hard to participate in an activity they were passionate about together. 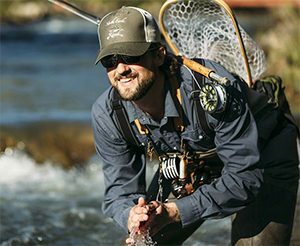 But in recovery, by learning to talk about the pain, to lean into the pain and to confront it, Eubanks was able to recover his love of fly-fishing. Eubanks transitioned his advertising and marketing savvy to a career in addiction treatment. Today, he works as chief operations officer at the Foundry Treatment Center, a 30-bed long-term comprehensive program in steamboat Springs, Colorado, that incorporates medical, clinical, wellness and family care. As necessary, addressing underlying trauma-related issues is part of the treatment. It would be hard to imagine Eubanks part of a program that did not recognize the significant role emotional pain plays in the origins of substance abuse and misuse. As proof of his own post-traumatic growth and a model to others that a full, healthy life can be accomplished “by choosing to harness adversity to impact change,” Eubanks also sits on the founding board of directors for 5280 High School, Denver’s first and only public recovery high school, and is a featured member of Speaker for Change, an international speakers bureau dedicated to providing education to overcome the stigma associated with addiction. He notes that without his experiences of adversity, “I wouldn’t be effective at what I do today. “I believe that emotional pain is what is driving the addiction epidemic,” Eubanks says to the audience. He continues by challenging listeners to think of someone they know who struggles with substance abuse. “I bet you can point to an element of unaddressed or unresolved emotional pain in that person.” Drugs and alcohol provide an immediate route to feeling better. Austin Eubanks delivers a TEDx Talk in Denver in July 2017. The only way around it is “to lean into it.” By that phrase, Eubanks means people must deal with their emotional pain. Doctors, nurses and first responders need to help victims address both kinds of pain, not by simply medicating the pain but by offering solutions that confront the emotional injury. Today, Eubanks credits the trauma he experienced for putting him in the position to help other people facing emotional pain and substance abuse. Interestingly, when he talks about trauma, he is referring to both the Columbine shooting and his struggle with addiction.